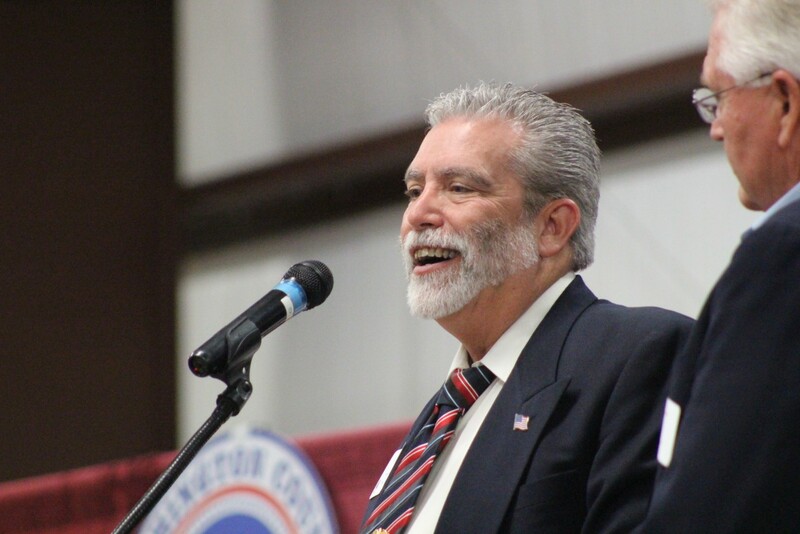 HURRICANE – The Washington County Republican Party met at the county fairgrounds Saturday morning to elect a new party chair and vice chair, as well as other party positions during its organizing convention. Area banker, pastor and former Washington County Commission candidate Jimi Kestin won the majority vote to serve as the new party chair. He defeated fellow party chair candidate Lane Ronnow in a 162 to 42 vote. Kestin said the purpose of the party’s organizing convention is to elect party officers – such as the chair, vice chair and others – who direct the party, support Republican candidates, run caucus meetings and help share the values and principles of the party’s platform. “When people understand what we stand for, they rally to that,” he said. People are attracted to Washington County because it is an amazing place with a great lifestyle, Kestin said. “We believe strongly that that lifestyle is a product of the principles we live by,” he said. Kestin said he wants to share the principles valued by Washington County Republicans with others, particularly newcomers, in order to promote and shore up the continued success of the county and party alike. Getting that message out, as well as expanding the party’s influence, will include getting more women and younger voters involved, he said. In addition to officers of the county party’s executive committee, representatives for the Utah GOP’s State Central Committee and legislative chairs are also voted on. Joining Kestin on the executive committee as vice chair is Celeste Maloy, who formerly acted as the party’s parliamentarian. She also works for the Washington County Attorney’s Office where she has focused on public lands issues facing the county. Maloy beat out fellow candidates Alex McGann and Marc Stallings. Incumbent county party secretary Brian Graf and new party treasurer John Olsen ran unapposed and were electted though acclimation. Six county party members were elected by delegates to serve of the state central committee, the governing body of the Utah GOP. Members of the committee vote on matters of policy, determine bylaws and propose resolutions for party delegates to vote on during the state-level party conventions. Elected to represent Washington County on the committee were Willie Billings, Rebecca Bronemann, Nick Lang, Mary Burkett, Colin Jack and Lamond Langston. Those elected to the Washington County Republican Party’s executive committee and the state central committee will serve a term of two years. A common theme among those running for central committee was continuing the party’s opposition to 2014’s “Count My Vote” legislation. 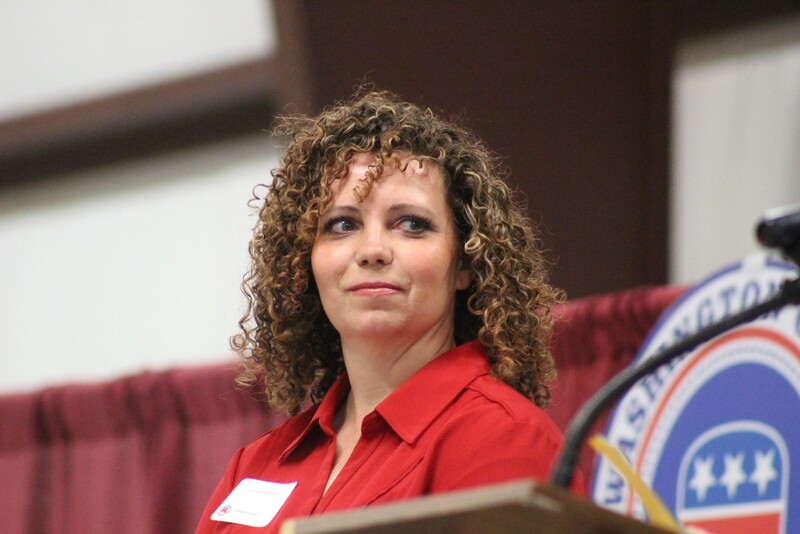 The law provides political candidates with an alternative path to a primary ballot outside of the caucus-convention system many state GOP delegates and officials consider sacrosanct. The legislative chair for Utah House District 74 was also up for election, with candidate Kim Staheli receiving the majority vote over fellow candidate Jennifer Kohler. Legislative chairs for districts 62, 71 and 75 were voted in through acclimation. With Eric Clarke winning 71 and Brooke Sullivan winning 75. Colin Jack retains he position as the legislative chair for District 62. 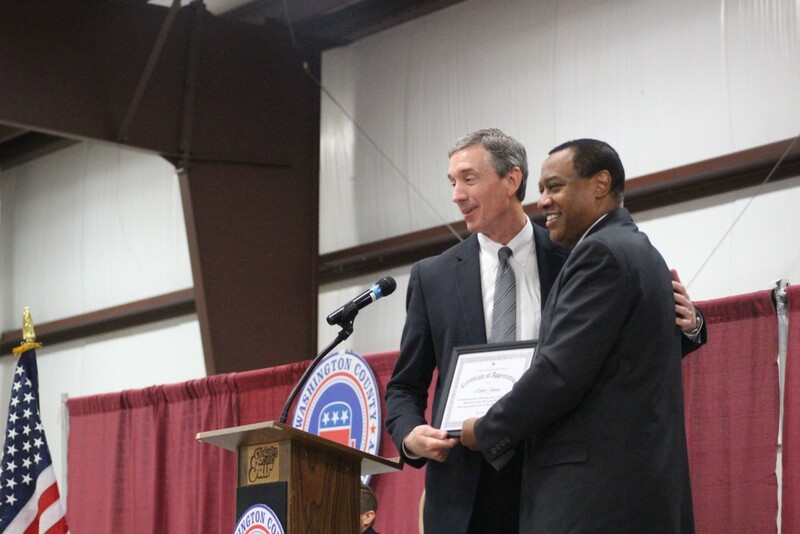 Utah Republican Party Chair James Evans attended the county organizing convention and recognized outgoing county party chair Robert Jensen for his “outstanding service” as a party chair. Evans also noted the success of the party’s Lincoln Day dinner that featured noted author and filmmaker Dinesh D’Souza. The dinner attracted an estimated 800 attendees. Washington County has a well-deserved reputation for being one of the “most Republican” counties in Utah. “It’s at the top,” Evans said. A total of 204 party delegate out of 517 attended Saturday’s reorganizing convention, making for a 40 percent participation rate. The Utah Republican Party’s state convention is set for May 20 in Sandy. Ed. note: Corrections have been made to items related to the executive committee and legislative chairs. Congratulations Mr Kestin and I’ll pray for you to help make a real difference in the party. Josh Savage-Treasurer chose not to run again. John Olsen was elected by acclimation as the new Treasurer. Leg Chair positions for Districts 62, 71 & 75 were won by acclimation but only District 62 remains unchanged. Only Colin Jack choose to run again (Colin was also elected to SCC as a new member). Congratulations to all of the new 2017-2019 WCRP Executive Committee & SCC members!